Yesterday, as part of our week-long celebration of our fortieth wedding anniversary, Clif and I went to Railroad Square Cinema to see Kedi, a Turkish documentary about the street cats of Istanbul. As the title of this post indicates, I absolutely loved the movie. However, before I get into a brief description of Kedi, I do want to establish I am more of a dog person than a cat person. Not that I don’t like cats. I most certainly do. At present there are two resident felines at the little house in the big woods, and I am very fond of both of them. But for me, dogs rank number one. That’s just the way it is. Kedi, which means cat in Turkish, follows seven cats and the people with whom they have bonded, including an artist, a deli owner, and a depressed man who finds meaning by feeding some of the street cats. From these people, there are lovely ruminations about cats and what they bring to the city. One woman notes that how we treat animals is a reflection of how we treat people in general. So true! The people, while taking care of the cats, admire their Independence and let them come and go as they please. Then there are the cats themselves—Sari, Duman, Bengü, Aslan, Gamsiz, Psikopat, and Deniz. The cinematography is nothing short of amazing as the cameras catch what cats do: prowl, climb, jump, leap, stalk mice, lovingly tend their kittens, fight, and show deep affection toward the humans who love them. 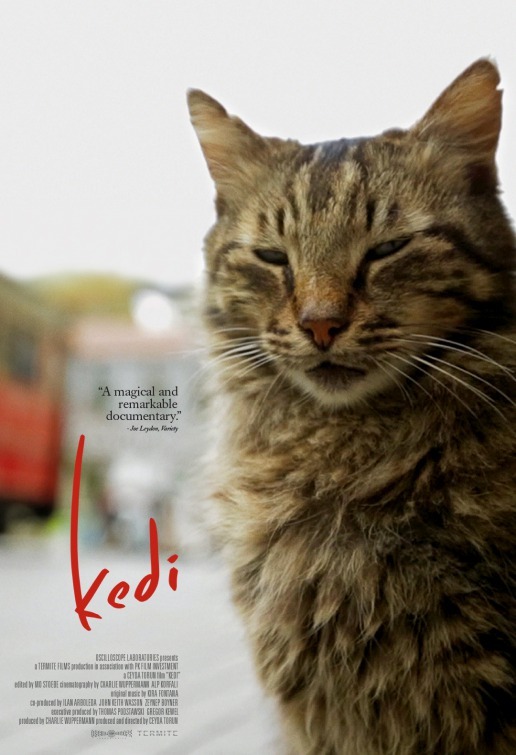 Kedi is a more a meditation about the street cats of Istanbul than a traditional documentary with an arc. For me, it worked so well that not only would I like to see this movie again, but I would also like to own the movie on DVD. And there are not many movies I feel this way about. Glad you had another good day leading up to the big one. 🙂 I’m really not a cat person, at all, so this wouldn’t be the movie for me, but very glad you enjoyed it. You might change your mind if you saw the movie. Although there’s not an arc, the movie does have a point, and it certainly taught me something I didn’t know. Sounds like this is the movie for me! 🙂 Perhaps ‘kedi’ is where we got the word ‘kitty,’ you think? Yes, I think you’d like the movie very much. I’m not sure if we get the word “kitty” from “kedi, but I have noticed there is often word similarities between languages. Congratulation on 40 years! Hope you are enjoy the latest winter weather (we have 6 inches so far, thus I expect your have 2 to 3 times as much). As to street cats, until the mid-1940’s that was the norm. Few people kept cats indoors, or to themselves. First cats kept the rodent populations down and were thus required to have claws and be outside. Second, the solution to cat poop indoors did not occur until the end of WWII. A clay called Fuller’s Earth was used in the defense plants to soak up oil/fuel spills. After the war, the company that mined Fuller’s Earth had a huge stockpile with few places to sell the stuff. Someone figured out that he could put a box of Fuller’s Earth inside, bring some cats inside, and they would poop and pee in the clay. Many thanks, Oscar. Yes, the history of cats and pets is an interesting one. However, the movie “Kedi” takes street cats one step further in that there cats, cats, and cats roaming the streets of Istanbul, a big city. I’ve never seen such numbers in New York, DC, or Boston. And, the people of Istanbul don’t seem to feel the need to “do” anything about the cats. So not only was the film beautiful and soulful, but it taught me something I didn’t know. Wow – That’s quite a bit of info! Thanks! Oscar’s comment is fascinating. When I was young, where we lived, few people even used kitty litter because our indoor cats spent lots of time outdoors. It seems like, at some point, FIV and feline leukemia became more prevalent and vets recommended keeping cats inside all the time. Did the film mention whether population control is necessary for the cats or how much of a problem they have with disease? No, there was no mention about population control or disease. It seemed to me that the cats were pretty much allowed to breed as nature intended. However, some of the “chosen” people did bring some of the cats to the vets when they were sick. And, the many, many cats featured looked very healthy. But, of course, there could be another side to the story. Thank you for this, I am planning to go and see the movie this week.